Following the success of our inaugural Safe Streets Academy, the National Complete Streets Coalition is excited to announce a new opportunity for free technical assistance. The Safe Streets, Smart Cities Academy will help three cities transform their commitment to traffic safety into practice. Applications are now open. Learn more about how to apply below or read the applicant FAQ. This Academy will bring together ten-person teams from three cities across the country for a series of three in-person workshops and six distance learning modules. The Academy will build the skills necessary to create safer, slower streets, including proven safety countermeasures, tactical urbanism, and community engagement. Participants will also learn about how emerging smart cities technologies provide opportunities to prevent crashes and save lives. Over the course of the Academy, each city will apply these new and improved skills to plan and implement safety demonstration projects in their communities. This free technical assistance program is made possible thanks to a Safe System Innovation Grant from Road to Zero, a coalition of more than 700 organizations committed to eliminating traffic fatalities in the United States by 2050. 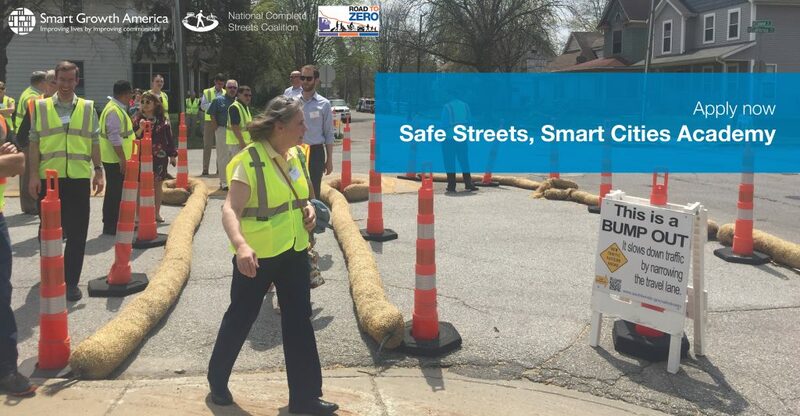 As part of the Safe Streets, Smart Cities Academy, jurisdictions will receive travel assistance and a $8,000 subgrant to support the demonstration project. Applications are now open. The deadline for submission is Sunday, August 19 at 11:59PM ET. We will conduct interviews with finalists the week of September 3. We hosted an informational webinar about the Safe Streets, Smart Cities Academy. You can watch the recording of the webinar on our FAQ page. You can also contact us directly with questions at [email protected]. We look forward to reviewing your applications!